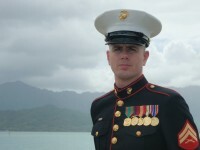 Corporal Justin Palmer, Hawaii, May 2010. Justin Palmer was born in Chicago, Illinois and received his undergraduate degree from the University of Chicago in 2004, with a bachelor of arts in Political Science and a minor in Near Eastern Languages and Civilizations. In March 2006 he enlisted in the Marine Corps as an 0311 Rifleman and attended recruit training on Parris Island the same month. He graduated in June 2006. In July, Private First Class Palmer attended the School of Infantry aboard Camp Geiger in North Carolina, graduating in September 2006. He reported to Marine Corps Base Hawaii in October 2006 and was assigned to Kilo Company, 3rd Battalion 3rd Marine Regiment in November. 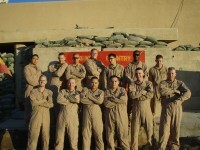 In December 2006, Private First Class Palmer was promoted to Lance Corporal. 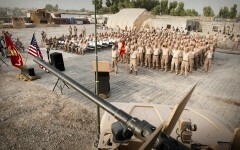 In August 2007, he conducted a deployment to Iraq in support of Operation IRAQI FREEDOM, returning in February 2008. In January 2009, Lance Corporal Palmer was reassigned to the Battalion’s S-2 Intelligence Section in Headquarters & Service Company where he filled the billet of Senior Intelligence Analyst. In April 2009, he conducted a second deployment to Iraq in support of Operation IRAQI FREEDOM, returning in October 2009. 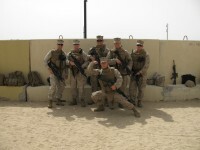 In January 2010, Lance Corporal Palmer was promoted to Corporal. 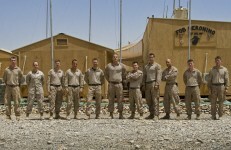 In May 2010, Corporal Palmer conducted a deployment to Afghanistan in support of Operation ENDURING FREEDOM, which concluded in November 2010. In March 2011, Corporal Palmer attended the Marine Air-Ground Task Force Intelligence Specialist Entry Course at Dam Neck, Virginia and in June 2011 received the new Military Occupation Specialty of 0231 Intelligence Specialist. 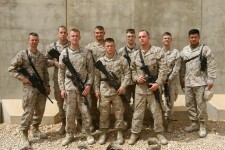 Upon completion of his tour with 3rd Battalion 3rd Marines in September 2011, Corporal Palmer was reassigned to Marine Corps Intelligence Activity in Quantico, Virginia. Corporal Palmer was promoted to Sergeant in July 2012. In July 2013, Sergeant Palmer transferred to Fort Meade, Maryland. In March 2016, Sergeant Palmer left active duty and the following month joined the Marine Forces Reserve as an 0532 Civil Affairs Specialist at 3d Civil Affairs Group at Great Lakes, Illinois. In June 2017, Sergeant Palmer left the Marine Corps to accept a commission as an Ensign in the United States Naval Reserve at Great Lakes, Illinois. Justin Palmer’s personal awards include the Navy and Marine Corps Commendation Medal, the Navy Achievement Medal with three gold stars in lieu of additional awards, and the Good Conduct Medal with two stars in lieu of additional awards. His professional military education includes Sergeants Course in April 2013. He is married to the former Jennifer Trout of Honolulu, Hawaii, and has two sons. S-2 Intelligence Section. Camp Virginia, Kuwait. April 2009. S-2 Intelligence Section. Al Asad Airbase, Iraq. August 2009. S-2 Intelligence Section. 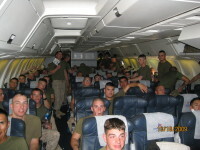 FOB Geronimo, Afghanistan. August 2010.